Barry Trotz doesn't want to hear anything about how his Nashville Predators overachieved in 2007-08. "I hate that word, overachieve," Trotz told NHL.com. "I don't think there is such a thing as overachievement. There is such a thing as playing to your potential." Last season, the Predators surprisingly reached their "potential" by making the Stanley Cup Playoffs. This year, Trotz thinks it will be harder for his team to crack the top eight in the Western Conference only because teams that finished below Nashville -- notably Edmonton, Chicago and Columbus -- made improvements by acquiring players via free agency or trades. The Predators mostly kept it in-house, but that's only because they're confident in what was already stocked on their shelves. They'll likely have to replace top-six forward Alexander Radulov, but Trotz is nevertheless comfortable heading into training camp. "Other teams have made changes by adding skill, but the one thing we can hang our hat on is we believe in our own people, we know how to develop and we play a team game," Trotz said. "We don't have to work on establishing our own identity." Trotz said he's not worried that the uncertainty surrounding Radulov's playing status in the NHL will throw everything into a tizzy for the Predators because he's operating under the assumption that Radulov will not be with the team. Knowing that, Trotz said he's banking on a pair of youngsters to make a significant jump into the top six, even though both Patric Hornqvist and Ryan Jones have yet to play a NHL game. Hornqvist, who is 21 and a former seventh-round pick, scored 41 goals and dished out 23 assists in 102 Swedish Elite League games over the past two seasons. Jones, 24, recorded 147 points in 161 games over four seasons at Miami of Ohio. Trotz said he can even see Hornqvist evolving into a 30-goal scorer, something the Predators did not have last season, even though they finished 12th in the League with 2.77 goals per game. "I'm very convinced he can play," Trotz said. "I talked to (Predators defenseman) Danny Hamhuis, who played at the World Championships, and he said Hornqvist was one of the better Swedish players. He's had success as a scorer, and I don't think I want to put him in a checking role." As for Jones, who came to Nashville in a trade that sent Marek Zidlicky -- the Predators' top scoring defenseman from last season -- to Minnesota, Trotz said he has seen and heard enough to know he's ready for the NHL. "Talking to our scouts and scouts from other teams, everybody seems to think this guy is the most ready college player," Trotz said. "We want to see him in the second hole, but if not he'll play in a third- or fourth-line role." A healthy Steve Sullivan, who missed all of last season with a back injury, could push Jones out of the top six. Trotz, though, said, "I think we have accepted the fact that Steve isn't coming back, and that's the right mindset to have." If the season were to start today, Trotz said he would probably put Hornqvist with team captain Jason Arnott and Martin Erat on the top line. Jones would join David Legwand and J.P. Dumont on the second line. Arnott had a nice rebound year last season with 28 goals and a team-high 44 assists for 72 points, which tied him with Dumont for most points on the team. Dumont led the Preds with 29 goals. 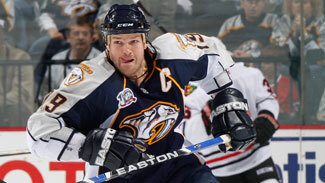 Erat was fourth on the team with 57 points, and Legwand was fifth with 44. Jones and Hornqvist could also add to a power play that finished 27th in the League last season. Jones is big enough to provide some net-front presence, and Hornqvist is another guy that will buzz around the net on the power play. The third and fourth lines have a mixture of size and speed with most of the players capable of netting between 10 and 15 goals. Vernon Fiddler, Scott Nichol and Jordin Tootoo could make up a strong third line. Each had at least 10 goals last season. Rookie Antti Pihlstrom, who played in one game last season but had 27 goals with Milwaukee of the AHL, could slot in there as well. Radek Bonk, Jerred Smithson, Jed Ortmeyer and Rich Peverley are the likely candidates to round out the forwards. "Our team is based on a four-line mentality, and I think our depth is better this year than last year," Trotz said. "We have to score using our defense. Our forwards can't do it alone. They're not skilled enough, but we have a lot of good forwards." The Predators' strong suit should be their defense as they have a young, active, mobile group with Shea Weber, Ryan Suter, Dan Hamhuis and Ville Koistinen as the headliners. All four should play on the power play as well. Trotz said he still likes veteran Greg DeVries on his top pair with Hamhuis. Weber and Suter should be together again on the second pair, leaving Koistinen on the third pair with either Greg Zanon or Kevin Klein. But the rising status of Alexander Sulzer and Cody Franson could throw a wrench into that thinking. Franson had 36 points in 76 games with AHL Milwaukee last season, while Sulzer had 32 points in 61 games with the Admirals. Koistinen, though, is the guy the Predators believe can make the biggest jump. He had 17 points and was a plus-13 in 48 games with Nashville last season, and Trotz said he's the reason the team felt comfortable trading Zidlicky. Koistinen will likely be a fifth defenseman, but he'll play top-four minutes when the Predators are trailing. He also has enough offense to be a key contributor on the power play. "He has a very strong offensive game and his defensive game has some holes, but we have got them to be manageable," Trotz said. "We can recognize when it's his time to play and we feel the drop-off from Zidlicky to Koistinen is minimal at best." Still, for this defense, it all goes back to Weber, Suter and Hamhuis. They're all 25 or younger entering the season. They're all mobile. They all can hit hard and provide a lot of offensive punch as well, combining for 78 points last season. Dan Ellis will enter the season as the man in Nashville after a strong finish to his 2007-08 season, which gave the Predators' front-office so much confidence in him that they dealt Chris Mason to St. Louis in exchange for a fourth-round pick. Ellis, though, could wind up looking over his shoulder, as Pekka Rinne is coming up fast. Rinne, who was 36-24-3 with a 2.47 goals-against average in Milwaukee last season, is another reason GM David Poile felt comfortable trading Mason. Still, this is Ellis' job to lose. He was 23-10-3 with a 2.34 GAA and six shutouts last season. He went on a tear at the end of the campaign to get the Predators into the playoffs, and he played well in the first-round series loss to Detroit despite facing 40 shots per game. Just in case, the Predators have Drew MacIntyre as the third goalie and Mark Dekanich will likely start the season in Milwaukee as well. Trotz said Chet Pickard and Jeremy Smith, two top prospects, will return to their respective junior teams. "On paper we have the most inexperienced goaltending in the National Hockey League in terms of games played, but I feel very confident," Trotz said. "Dan Ellis showed me a lot with his demeanor and the way he is handling things, and I have no questions about Pekka's ability to play in the League. I think he is going to be one of the special players in the League." * The Predators have a stable of young talent ready to emerge as NHL players, including Hornqvist, Jones, Sulzer, Klein, Koistinen, Franson and Rinne, who may all be counted on greatly this season. * The backbone of this team is the defense, and it has the makings of one of the League's strongest units with Weber, Suter, Hamhuis, DeVries and Koistinen leading the way. It's a young, fast, mobile group that will allow the Predators to take some risks offensively. Weber, Suter and Klein all re-signed for multiple years this summer. Koistinen is playing on a one-year contract, so the incentive is there for him to have a big season so he can earn a long-term deal next summer. * The Predators' identity is in place, which means this team knows exactly what it's all about and it has the stability in the front office and behind the bench to keep things consistent. Other teams may have made bigger splashes in free agency, but now they have to develop chemistry. The Predators already have that chemistry teams crave. Contact Dan Rosen at drosen@nhl.com.